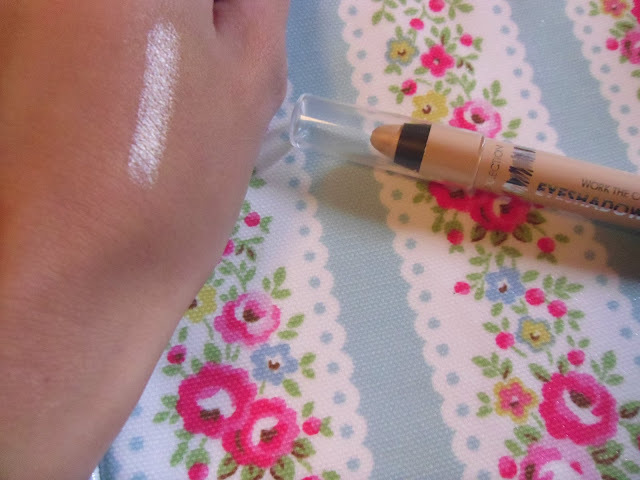 When it comes to highlighters or any thing similar I'm like a magpie and have to purchase it (I nearly wrote steal then) thinking about what magpies do with silver haha! Now you probably all know Collection for their Lasting Perfection - Concealer which we all love just a tad too much. 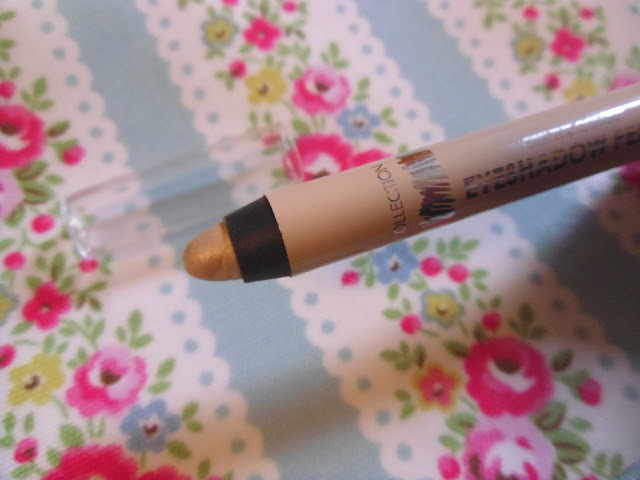 Well when I was mooching around Superdrug the other day I came across the 'Collection - Work The Shadow - Eyeshadow Pencil' I didn't really know what I would think to an eyeshadow in a stick or in fact the texture of it as I quite like my powders. Plain Jane sometimes, I know! But there seems to be quite a lot of eyeshadow pencil's about at the moment so I thought I would try one out. I must admit this shade caught my eye the most, it's called Vanilla Sky. I'd label it as quite a light champagne colour. I apply mine in the inner corners of my eyes and sometimes as a base all over my lid. Now I didn't actually realise that this was waterproof until I tried to rub my swatch after it had been on about 20-30 seconds and it wouldn't budge. Kind of gave myself an Indian burn! I was wondering why it was actually staying put all day. Now they are really easy to blend in, but you do need to be quite quick as I say after so long they won't move a muscle. This may have to be another one of my favourites from the Collection range. I can't stop reaching for it in a morning and the longevity is so so good! Collections - Work The Shadow sticks come in 6 different shades and are only retailed at £2.50. You can pick these up in a Superdrug drugstore or online on their website. Just a little update as I'm so excited! My mum and dad have surprised me with a little get away to Tunisia in 13 days. We are staying in one of the nicest hotels I've ever seen and I cannot wait to take advantage of the spa and all their treatments. I'm quite nervous about flying this time as it's been quite sometime since I last went on a aeroplane, but I'm so looking forward to it and the all inclusive food of course. You can't say no with the price can you :) and thank you! I'm counting down the days. Definitely hun :) It makes you look more awake that's fo'sure. I'm still quite shocked by the longevity of it & I forgot to mention that it doesn't crease in the lid at all. I've been eyeing this up for a little while, oh another thing to add to my 'to buy' list. I hope you have a really good holiday! Haha my 'to buy' list is ever so long as well. It's well worth I definitely recommend you to pick it up next time :) Thank you lovely! I can't wait! Yeah there's a really nice light pink colour that I was tempted to pick up. 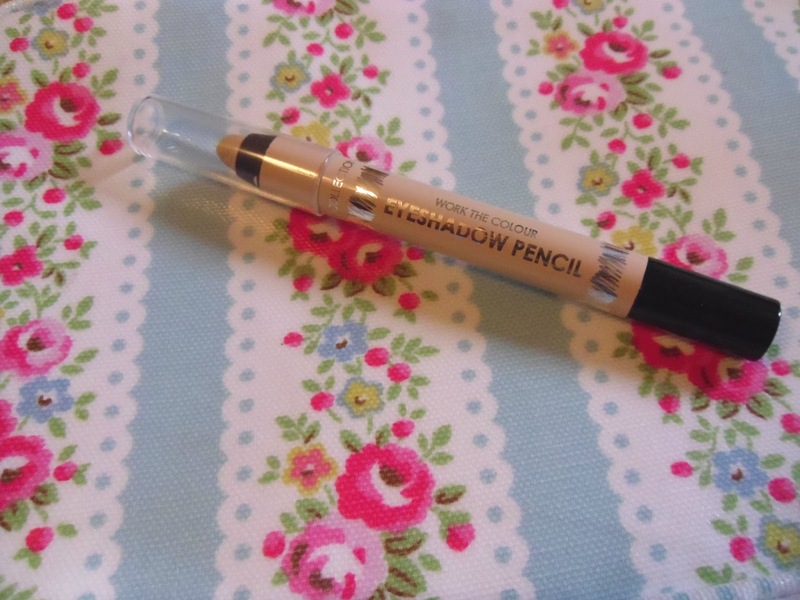 Ahh thanks :) It's just a little something from Cath Kidston. I LOVE that shop! I love them. the vintage blush one is lovely too. I follow your blog now and nominated you for a liebster award. Maybe you want to flollow me? Is that the light pink one? I was going to pick that one up too but thought I'd see what they were like first :) Thank you! That's sweet, I'll definitely check it out lovey. Definitely worth giving it a go! The swatch looks beautiful! When it comes to highlighters or any thing similar I'm like a magpie and have to purchase it - me too ^^ my dream highlighter on my wish list atm is the one from Chanel, it has this beautiful emboss on it. im still not sure if im going to buy it for myself bec its expensive. let me find a link i wanna show it to you sec. wow! this swatch looks so gorgeous! You would never guess from seeing it in the package! I'm such a sucker for champagne shadows too this looks gorgeous, & great price too! Exciting news about your holiday too huni, tan time :) ! I've used it everyday since purchasing it!